It was with trepidation that we approached Girl Skate Jam UK 08 and not just because Jen and Jen, having acknowledged the need to get proper jobs after years of pretending working at the skatepark was going to pay the rent, were still organising things for the comp at 2am the night before. Hey that’s what being a proper adult gets you… damn you hectic work schedules! If only the plan to imprison local kids and train them to be superstar skaters had paid off…Anyway, less talk of kidnap, more talk of girls’ skating. 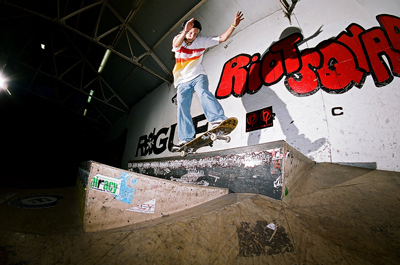 It was the comp’s fifth birthday at the Pioneer skatepark, although the seventh competition overall. Right, now a confession: if there’s any bits missing from this review please don’t blame me. My lovingly hand-crafted notes of what tricks everyone pulled were partially destroyed in a tent catastrophe at NASS. Has nothing to do with the fact I’ve just discovered the joys of Kopparberg while writing this review. That’s just a happy coincidence. The comp unfortunately clashed with NASS weekend and the Download Festival, but plenty of girls turned up from all over the country to get together to skate and enjoy the day. But it also meant that several of us ladies drove to Bath together to catch the girls comp at NASS straight after. Two comps in one day? No problem for these girls, they’re made of strong stuff! At last year’s comp Belgian beast Evelien Bouillart pretty much killed it and left people scraping their chins off the floor when they saw her compete, but having broken her wrist at Milan Girls attack she was unable to make it over for this year’s event. But no matter, the UK girls were there and ready to represent. Weather wise it turned into a pretty perfect skating day, warm and sunny but not too hot. Anyone who’s skated Pioneer on a hot day will have suffered the Gersh effect, but thankfully the sweat was kept to a ladylike sheen, despite the effort being put in by everyone. Once again the comp was split into four sections: under 18, over 18, sponsored and miniramp. The street categories consisted of two runs of two minutes each, with a 20 minute jam format for the miniramp comp. In the under 18 section Kim Lewis deservedly grabbed first place with her bunch of tricks that included kickflips on the bank and various freestyle tricks including switch flips, nollie flips, a varial flip and a great fakie bigspin flip. In the over 18s comp all the girls put on an impressive performance and having seen them all skate before I knew that first prize could have been anyone’s. Noteworthies included Sadie Hollins’ nollie flips on the bank, Becky Wood’s determination to land her boardslide despite having a few pretty good slams, Emma Richardson’s 50:50s and Faye Chadburn’s bigspin. But it was Kerri Dennis who once again waltzed off with first prize. She made great use of the whole park, took a pretty hard slam from the Koston (which also won her worst slam of the day) and still pulled off noseslides down the driveway ledge, fakie 180s, shuvs and a bunch of other tricks. As usual before the sponsored section it was time for the mini comp, giving everyone the chance to enjoy some sun on the outside miniramp. The comp was mixed age and took a 20 minute jam format to make sure everyone had the chance to pull their favourite tricks out for the crowd’s pleasure. Third place went to Helen Lovelee for her stylee 5-0s, 50:50s and boardslide. 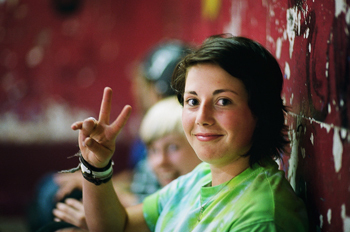 Becky Jacques took second spot with lots of grinds, fakie rock fakies and rock and rolls. But the miniramp tramp trophy went to the excellent Lois Pendlebury. She produced a veritable feast of tricks including all manner of grinds, frontside ollies and a kickflip rock fakie. After the miniramp festivities it was time for the spectators and skaters to pile back into the park for the eagerly awaited sponsored section. Fran Stroud, Georgie Winter, Helena Long, Lois Pendlebury, Lucy Adams and Maria Falbo battled it out, each pulling tricks with great style. From the remains of my ruined notes, I can tell you that third placed Helena Long pulled a boardslide, 50:50, blunt fakie and kickflips. Lois Pendlebury took second with a big ollie over the driveway, b/s 180 ollie, wallride and kickflips, despite having given her all in the miniramp comp moments earlier. In the end it was Lucy Adams who took the crown. Her run included 50:50s and noseslides down the driveway ledge, 50:50 on the koston, kickflips and fakie flips on the flatbanks and a couple of boardslides. Other notable events on the day included several trouser ripping incidents (at least one of girls was happy to find jeans amongst the prize-bag goodies! ), MC Mat Lloyd mispronouncing Maria’s name for most of the day and a long haired young boy accidentally being invited to take part in the comp because we thought he was a girl. Whoops…! All in all it was another pretty successful Girl Skate Jam UK. The girls got together with people they hadn’t seen for a while, skated and had fun. There’s a brilliant close-knit scene developing amongst the UK’s girl skaters thanks to the ever-increasing number of girls’ jams and comps that are happening across the country. So all that remains to be said is a big thank you to our sponsors Rogue Skateboards, Vans, Eastpak, Nikita, Pro Tec, Crème and Conspiracy Skate Shop. Once again props to Pa Selby for making the coveted girl skater trophies at last minute notice. Thanks to our MC Mat Lloyd and Judges Gary Milne and Big Chris who agreed to help us out at the last minute, everyone at Pioneer who helped on the day and of course a big big thank you to all the girls for turning up and turning it on! Hopefully we’ll see you again next year!